1. I am US citizen abroad who never filed a tax return, where do I start? 2. What is the IRS tax expat amnesty program “Streamlined procedures”? How do I qualify? 3. Should I file any additional forms, like FBAR? 4. What fines and penalties might I face for not filing my tax returns on time? 5. IRS hasn’t contacted me, should I still file my taxes? It’s easier to become tax compliant than you might think. Many Americans and U.S. persons do not even know they still have to file their tax returns when they build their lives elsewhere. There are roughly six million Americans every year in the same situation as you, who also have to catch up with their U.S. tax obligations. The IRS is aware of this fact and so has introduced a few amnesty programs, such as The Streamlined Procedures, where they waive all the penalties for expats! First of all, gather all of your income and expenses documentation. Most of the time you will need documents from your host country, such as statements of income, mortgage interest paid, housing expenses, capital gains or losses and interest earned. In order to participate in the Streamlined Foreign Offshore Program, you will need to file three years of delinquent tax returns, six years of FBARs (if required), and a certification statement providing a reasonable cause. Most of our clients do not owe any U.S. income tax because either the amount of foreign tax they have paid can offset their U.S. tax liability or they have used the Foreign Earned Income Exclusion to lower or eliminate their taxable income. In fact, our clients are eligible for certain credits in some circumstances and receive a refund in the form of a paycheck. This is subject to limitation, and so consultation with a tax expert is recommended. You may be subject to the failure to file penalty, unless you have reasonable cause, such as the death of a family member, mental illness, alcoholism, bad advice from your accountant, or extended military service. A tax that is not paid in full by the original due date of the return (regardless of extensions to your time to file) may also result in the failure to pay penalty unless you have reasonable cause for your failure to pay in time. Interest is charged on taxes that are not paid by the due date, even if you have an extension of time to file, and is also charged on penalties. There’s no penalty for failure to file if you’re due a refund. However, you risk losing a refund altogether if you file a return, or otherwise claim a refund after the statute of limitations has expired. An original return that claims a refund must be filed within 3 years of its due date for a refund to be allowed in most instances. The next step is to check if you need to file FBAR forms, in case you haven’t listed your foreign bank accounts before. If you have either a financial interest or signature authority over the accounts, and the total value exceeds $10,000 at any time during the calendar year, you will need to file FBAR. The U.S. Department of the Treasury can impose significant penalties for failing to do this, including the seizure of assets. If you still feel lost while catching up with your taxes, don’t hesitate to contact us. We’ve helped hundreds of people to become and stay compliant. In June 2014 an updated IRS tax expat amnesty program, known as Streamlined Foreign Offshore Program, was introduced. It is a friendlier way to catch up with U.S. taxes and become tax compliant without facing any penalties. It is available to US expats who have failed to report foreign financial assets and pay all the tax due as a result of the non-willful conduct. What is non-willful conduct? The IRS defines this as conduct “due to negligence, inadvertence, or mistake or conduct that is the result of a good faith misunderstanding of the requirements of the law”. This is a very broad definition and leaves a lot of space for free interpretation, which may not be good for you as a taxpayer. Therefore, we recommend that you seek professional advice from an expat tax company. By using IRS expat tax amnesty program you need to file the last 3 years of federal tax returns and 6 years of FBARs, certify that your past failure to file was non-willful and pay any tax that may be due. If the IRS agrees that you are eligible for the program, then there will be no penalties imposed. All the returns must have a valid Taxpayer Identification Number (TIN). For U.S. citizens, resident aliens, and certain other individuals, the proper TIN is a valid Social Security Number (SSN). You may also claim any applicable exemptions, like the Foreign Earned Income Exclusion, and end up not owing any taxes. But to do so, you still need to file and become tax compliant. It’s better to file and pay the tax due before the IRS finds you and imposes its fines, as this will leave you without an opportunity to use the penalty-free way of becoming compliant. So, if the IRS has initiated a civil examination of a taxpayer’s returns for any taxable year, regardless of whether the examination relates to undisclosed foreign financial assets, the taxpayer will not be eligible to use the streamlined procedures. They have financial interests or signatory authority over at least one financial account located outside the United States. The aggregate value of all foreign financial accounts exceeds $10,000 at any time during the calendar year that is reported. If you have reported and paid tax on all income before, but haven’t filed FBARs for previous years, then you can file the delinquent FBARs along with a statement explaining why the reports haven’t been filed before. The IRS will not impose fine on you if there are no underreported tax liabilities and you have not previously been contacted by them. So to avoid penalties, you need to file delinquent FBARs as soon as possible in order to minimize the chances that the IRS will begin an audit or independently request the FBARs. At the same time, this option is not available to all taxpayers. If you have failed to file tax returns altogether because you weren’t aware of your tax obligations, then you can bring yourself into compliance by taking advantage of the Streamlined Foreign Offshore Program. 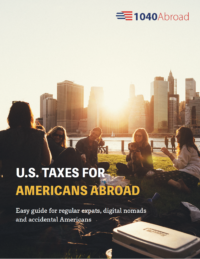 It’s a more comprehensive and time-consuming option but it comes with a significant advantage: the IRS waives all penalties for U.S. persons abroad if you qualify for this program. There are two types of penalties from the IRS: failure-to-pay and failure-to-file penalties. A failure-to-file penalty may apply if you did not file by the tax-filing deadline. A failure-to-pay penalty may apply if you did not pay all of the taxes you owed by the tax filing deadline. Failure to file: If you filed your return late, but within 60 days of your U.S. expat return due date, this will generally equal 5% of the amount of unpaid tax. This same amount applies to each new month that the return is late, but the penalty cannot exceed 25% of the total amount of unpaid tax. Additionally, the minimum penalty for filing more than 60 days past the filing or extension date is 100% of the unpaid amount or $135 (whichever is smaller). Failure to pay: Filing your expat tax return is half of the deal, so if you failed to pay your taxes, then you are subject to a failure-to-pay penalty. This is assessed at a monthly rate of 0.5% of your actual or perceived tax liability (which also cannot exceed 25% of the amount owed). You can avoid this penalty if you file an extension and pay at least 90% of your owed taxes by the initial due date. As an American abroad who has paid tax before June 15, you will be charged interest on the amount accumulating from the April deadline. But if you pay your taxes after June 15, then you will face penalties, even if you have an additional extension. If you’re hit with both penalties, then a failure to pay the penalty is deducted from the failure to file penalty. There are cases when expats include a letter with their late tax returns, explaining that they failed to file because they didn’t know about their tax obligations while being overseas, and this may be accepted by the IRS and the penalties waived. A non-willfulness penalty – this cannot exceed $10,000 and may be imposed on any person who violates the FBAR filing and record-keeping requirements. A willfulness penalty, which may be imposed on any person who willfully fails to file the FBAR, with the ceiling on the penalty being the greater of $100,000 or 50% of the balance in the account at the time of the violation. The U.S. Treasury Department reserves the right to seize up to 50% of assets in overseas bank accounts or $100,000 per account, whichever is the higher. The passport revocation law, which came into effect in late 2015, allows the U.S. State Department to revoke the passport of any U.S. citizen who owes more than $50,000 to the IRS. It’s quite easy to end up with this tax debt through accrued interest and penalties while living overseas as an expat. We strongly recommend that all American expats become tax compliant by using the Streamlined Foreign Offshore Program. We have helped hundreds of expats to catch up with their taxes and avoid penalties. We will be more than happy to provide you with guidance and assess your situation. Contact us now and we will get in touch with you promptly. Yes, we strongly recommend that you file your tax returns and pay any taxes as soon as possible. If the IRS or U.S. Department of the Treasury catch you not filing or failing to pay your expat tax, the penalties could easily escalate to the maximum amount. This includes financial fines and even potential jail time. So do not be afraid to come forward voluntarily as the IRS treats better people who do this, rather than those they catch themselves. We strongly recommend that you become fully tax compliant as soon as you become aware of your tax obligations. With the introduction and enforcement of FATCA law, it is very likely that the IRS will find you sooner rather than later if you are earning (big) figures of money abroad. It’s just question of time. Your foreign bank will report on your financial assets to IRS as part of FATCA law. Did you know that third parties, such as employers, banks and brokerage firms, are required to report your income to the IRS? If the IRS notices that a third party has paid you income, but you haven’t reported that income on your return, this will immediately lift a red flag.